Looking west from Main Street: Dirt has been moved. On Tuesday there were the first signs of actual construction at Edgewater Village, the riverside residential development in which the city of Albany has invested $2.4 million of urban renewal money. As you can see, a backhoe operator had been busy moving some dirt, apparently in preparation for installing utilities. A pile of pipes was stored on the site. 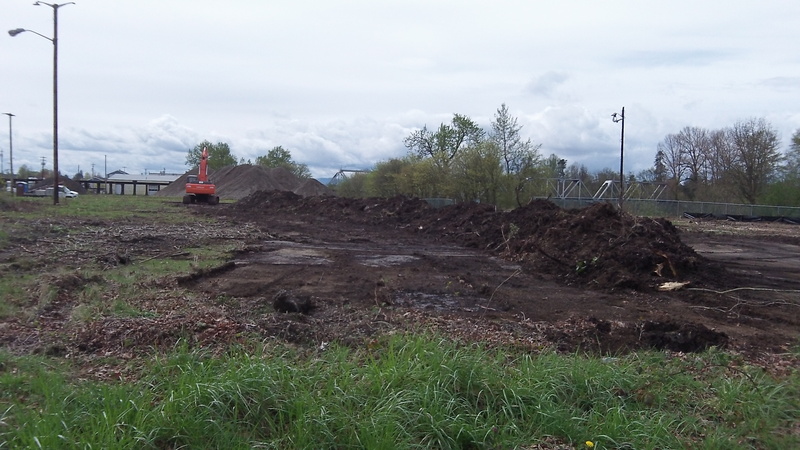 The property of nearly 6 acres between the Willamette River and Water Avenue was cleared of brush and accumulated trash in February. At the time, the city announced it expected construction to start in March. The developers almost made it, starting on April 1 instead. The plans changed several times over the years until the city planning commission in 2013 approved a site plan calling for 58 single-family lots. Last month, though, the announcement on the occasion the site being cleared spoke of 60 units. Maybe as requisite to receiving “government” money, a certain percentage of “local” contractors must be used. One sees these various construction jobs and the contractors seem to be predominately from out of town. Many of the road projects seem to use out of state contractors. Does the state regulate/tax local & state businesses to the degree that they can’t provide the lowest bid?